"When you wear the enchanted hat and turn the diamond, you will see the inside of things...the soul of Bread, of Water, of Fire." Since fairy tales have a timeless quality, it's interesting that few new ones gained acceptance in the 20th century. 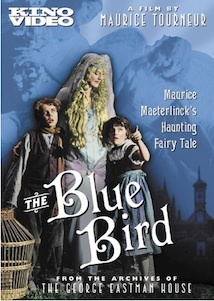 One of the very few that did was Belgian author Maurice Maeterlinck's The Blue Bird, an elaborate fantasy that took the forms of a poem and a stage play before being adapted at least three times to film. This first motion picture adaptation is by acclaimed director Maurice Tourneur, and is notable for both its visual inventiveness and its faithfulness to Maeterlinck's original. Young Tyltyl (Robin Macdougall) and his little sister Mytyl (Tula Belle) live a humble life with their parents (Edwin E. Reed and Emma Lowry), longing for the storied Blue Bird of Happiness. Most of the film is a dream sequence as the Fairy Berylune (Lillian Cook) gives Tyltyl an enchanted hat that allows him to see the souls within all things. The children are accompanied by their ensouled Dog (Charles Ascot), Cat (Tom Corless), Milk (Eleanor Masters), Fire (S.E. Potapovitch), Light (Gertrude McCoy), Bread (Sam Blum) and Sugar (Charles Craig). Fairy Berylune takes them successively to the Palace of Night, to visit with their dead grandparents and brothers and sisters, the Palace of Happiness and finally the Kingdom of the Future, where they meet the as-yet unborn. But since the Fairy has prophesied that those accompanying the children will not survive the trip if it is successful, they must contend with the Cat's hidden efforts to thwart them at every step. There's a lot of content here, with Maeterlinck not only anticipating the Gaea theory by the attribution of souls and awareness to everything living and nonliving, but the story as a whole serves as an allegory of the human soul. Rich with theosophical conceits, the film posits an endless stream of life from which we are taken and to which we return, with a large dollop of predestination. It does so without being overly doctrinaire, and manages to be a little shocking at times (such as the revelation that the dead younger brothers and sisters number at least seven, an indication of bleak child mortality rates). The conclusion is a bit hamfisted, with Tyltyl and Mytyl directly addressing the camera and lecturing the viewer, but otherwise it's palatable enough. Transitions feel a bit abrupt, however, and the quest feels rather unsatisfying in its conclusion. The coda does help make good on the latter defect, however, anticipating The Wizard of Oz in some respects. The cast is quite strong, particularly young master Macdougall, who gives a very naturalistic performance that has plenty of subtle shades to it, not all of them favorable. Tula Belle is utterly charming as the little sister. Lillian Cook, who died within months of release at the age of 19, is a suitably ethereal presence and makes for a memorable fairy. Charles Ascot is quite entertaining as the Dog, and really hams it up with behavior that any dog owner will recognize. The dialogue given to the Dog is particularly good, such as his references to the children as his "little deities." The other spirits are less compelling, though the wicked Cat (sorry, Intrigo) has his moments as well. There's also an odd appearance by Edward Elkas in drag as the Tyl family's crone of a neighbor, Widow Berlingot, who sets the story in motion. The visuals are an odd combination of the forward and backward-looking. There's some striking effects work at times, such as the dance of Fire, while Tourneur also runs the film backwards to give an effect like a M�li�s film from decades earlier. It's unfortunate that the film feels so stage-bound, since it really calls for a more open presentation than it gets. The original decorative intertitles are quite attractive and evocative. The film is mostly complete, although the head titles are video-generated, apparently lost to decomposition. The George Eastman House was the source of the print; they have been notorious for being uncooperative for video releases so perhaps this DVD is a sign of good things to come from their archives in the future. Image Transfer Review: The original full-frame picture is thoughtfully windowboxed so as to not lose picture (especially on the critical title cards) to overscan. The print suffers from some decomposition in spots, but there's little other damage and it is quite watchable. It's an original tinted print from the period, so the picture is detailed and nicely textured, with a very good greyscale. Audio Transfer Review: The esteemed Mont Alto Motion Picture Orchestra provides a compilation score that's quite appropriate without Mickey-Mousing the film to death. The moods follow quite well, and the only sound effects supplied are a few raps at the door. There's a broad soundstage that gives depth and spacing to the instruments of the small orchestra, giving the sensation that they're in the pit before you. The recording quality is first rate and there's nothing at all to complain about here. Extras Review: A few thoughtful extras are included. The first is a gushing 1918 review from The New York Times that is almost embarrassing in its effusiveness. A biography and filmography are provided for Tourneur. Most interesting are two excerpts from the play version, from Acts I and V, covering the revealing of the souls of the Things, and the Kingdom of the Future. Other than severely trimming the tediously long dialogue, the film obviously tracks the play quite closely. One notable exception is that the movie omits the grim fates that await some of the unborn, including that of the doomed brother about to join Mytyl and Tyltyl. A link is provided to play the relevant sequences as well. A full-length comparison of the two versions would have been fascinating, but this is certainly valuable as it is. A strange and evocative fantasy that is an important title from the silent era. Some useful extras are included, and the transfer is quite nice.